Catherine Coleman Flowers in SSZ. Photo by author. Catherine Coleman Flowers lives in a planned suburban community in Montgomery, but her heart is in Lowndes County. She grew up in Black Belt, a small unincorporated community neighboring White Hall. A student activist and an Air Force Veteran, Flowers’ political education was rooted in the freedom rights movement in Lowndes County; both of her parents were heavily involved. But she was influenced just as much by the daily ethics of her local community as by their political engagement. “Everybody had big families pretty much, my family was five children, and we would all be [on our neighbor, Ms. Shug’s porch] in the evenings listening to Ernie’s Record Mart on the radio—that’s how we kept up with music,” she said. “And Ms. Nell’s house was popular because [she] used to pierce ears and sometimes she would sell little stuff…snacks and so forth. And that’s where the [community water] pump was located. Most people didn’t have running water in their houses. We had an outhouse, too, although we had the bones for the plumbing in the house. Other people had outhouses. As a young woman, Flowers left her community, living and working for decades in major cities—DC, Atlanta, Detroit—the latter where many Black folk fled from Lowndes County as part of the Great Migration. She once dreamed of being a Soul Train dancer and a Hollywood filmmaker. She became a teacher and historian instead—once working with civil rights historian Taylor Branch, and more recently African American literature and history scholar Henry Louis Gates on their respective histories of Lowndes County. She is avid follower of her family's genealogy, tracing it back long before the Civil War—to the Carolinas, to Virginia, to Thomas Jefferson's descendants on Sally Hemings’ side. She ultimately staked her future back in Lowndes County, returning in 2000 to continue the work of building Black freedom and autonomy. "When I went back home in 2000... I saw that things hadn’t changed that much," Flowers said. "I mean, there were Black elected officials, but in terms of having access to wastewater infrastructure, I saw that that was not there. And I also saw there wasn’t an investment in making sure that people had some of the other kinds of amenities. People still had to drive long distances to maybe get to a pharmacist or get to a well-stocked grocery store." Her recommitment to Lowndes County was rooted in the rich community legacy her parents left behind. Her father, JC Coleman, a veteran and salesman who once challenged the powerful incumbent Black Sheriff John Hulett for office in 1974, died in 2000. Her mother, Mattie DeBardelaben Coleman, was a community activist who organized with the National Welfare Rights Organization to investigate the forced sterilization—including her own—of Black women as part of the eugenics experiments in Alabama. She was also a teacher's aide in special education at the local schools. She was killed in a murder-suicide two years later while trying to assist a man with mental illness. Two thousand people attended her funeral. "My parents were like the jailhouse lawyers of our community. Anytime someone had a problem, they would knock on my parents’ door all times of the day and night, " Flowers said. "Whenever [community members] would get letters from the government, had to make decisions, even criminal cases, they would come and ask for their advice. "Another word [for my parents] would be ‘fixers’, ‘cause that’s basically what they did. [My mother's murder] was pretty traumatic but from that I knew that they had prepared me for this. My father loved Lowndes County, and my mother...died helping somebody. And that’s kind of the way my family has always been. We’ve been blessed with skills and the access that other people don’t have, and what I was taught is that instead of using your skills and your access just for yourself, you help the community, too. And that’s what I try to do." Embraced by her community, Flowers began working in Lowndes County as an economic development officer. 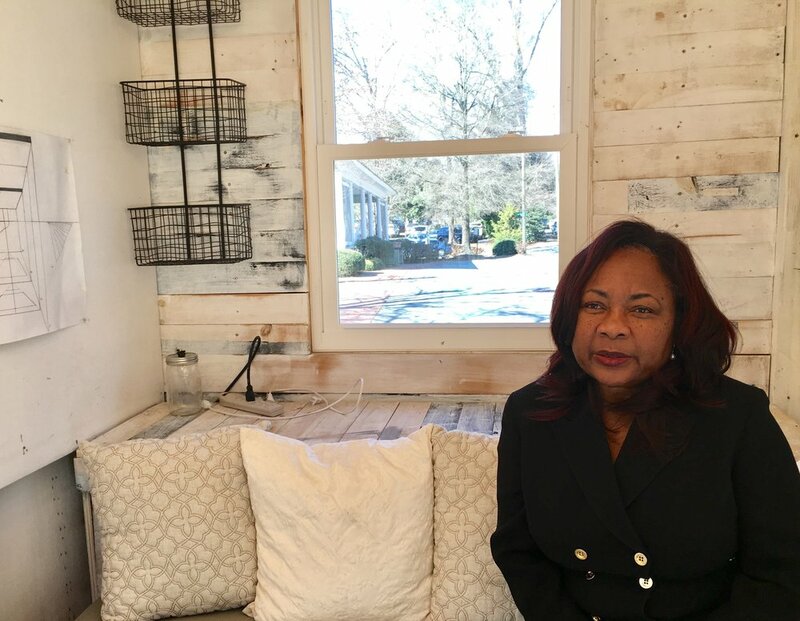 Seventeen years later, she is the founder and executive director of the Alabama Center for Rural Enterprise (ACRE), a community development corporation based in White Hall that fights to build basic infrastructure throughout the County. Beyond the lack of extensive sewer systems, much of the Black Belt soil is thick loam or clay, making it difficult for standard septic systems to percolate water. More adaptive systems often cost 2-3 times the standard systems. “A lot of my work has focused since 2005 on the wastewater issue, specifically. And that’s been one of the hardest things in the world,” she said. Wastewater sanitation remains one of the most challenging infrastructure challenges in the U.S. impacting the health of communities from the colonias on the U.S.-Mexico border to the San Joaquin Valley to the wealthy White communities on Cape Cod, MA. The challenges vary in type or degree; however, the communities impacted are mostly Black, Brown, and poor. Thus, though Flowers describes former White Hall mayor John Jackson as a “community mayor” who fought for decades to grow the town, the infrastructure proved nearly impossible to attain, particularly when compared to other long-established towns in Lowndes County. "[White Hall] grew, but it still didn’t have the infrastructure,” Flowers said. “Hayneville has the infrastructure because Hayneville was a White town and it was the county seat. Fort Deposit had the infrastructure because Fort Deposit was a White town. Beatrice Anderson lives in Lowndes County for her freedom. At 36, she and her husband Keon Dudley choose to raise their five children in their hometown White Hall, which they prefer to most places. Both grew up in homes without indoor plumbing; they now work as occasional plumbers, laying water pipes and installing septic systems, mostly in trailers set up on Black family homesteads. Anderson lived with her family in Montgomery once, for about a year. It didn’t work out. The couple doesn't ignore the town’s needs, however. Unemployment is still high, jobs don’t pay well enough, recreation is limited—you need Army Corps permission to get access to the Holy Ground Park on the Alabama River—and there aren’t many activities for young people. Dudley became disabled at 21, after working for several years at S&C Beef Processing plant outside of Montgomery. Most White Hall residents work either at the casinos, one of the Hyundai plants, or the poultry processing plants. Big industry has the easiest entry to the county—they’re offered major tax breaks and guaranteed access to infrastructure, while the communities are left out. Dudley and Anderson don’t plan to leave White Hall, at least not anytime soon. Their dreams for their hometown are practical. They want jobs that pay more than the current minimum wage—$7.25. They want activities for young people. They want gas stations and stores that aren’t far away. Aside from building infrastructure, Flowers wants White Hall to protect the landscape and the community-centered culture that raised her, that brought her back decades later. “I would still it to maintain its rural quality,” she said. "I would like for it to have some of the amenities that some people would like to have, without having to go to Montgomery or Selma. When I think about White Hall, I think of a quiet community with a certain type of lifestyle that’s relaxed. I wouldn’t like to see that go away. Lyndon White doesn’t remember the Voting Rights March coming through White Hall (he was born in 1965), but he does remember the Klan’s response ten years later.